How can I reduce stress while traveling? What to bring while traveling? What to do before going traveling? How to plan a stress free travel? Traveling is now the dream of every individual and every human being want to travel the world for their own passion and fun. For a stress free travel, one must take care of all the small things. If you are traveling abroad or local, planning is to be done in advance for a stress free travel. People have been in such positions where traveling is being stressful for them. Like navigating through the airport, baggage problems, forgetting things at home, no proper budgeting etc. If you want to make your travel relaxing and refreshing and enjoy the most of it then you need to do take care of below mentioned things. 1. Know the Reason for your Travel. Ask yourself why you have planned your vacation is it for relaxing, adventure, exploring new places etc. Knowing your goal to travel is the most important. Like if I am traveling for relaxing, I know that I do not have to be in rush or take electronics with me. Once you have decided your goal the next step is to decide where to go and on what budget. 2. Set a Budget for Stress Free Travel. Budgeting is needed when you travel abroad and you should split all the areas of interest and decide yourself where you want to spend and how much. Make a budget for transportation, hotel, exploring, food, experiences etc. People go off budget when they travel and sometimes they spend so much while they party and forget that they have the next day pending to explore. Do not do that. Make a per day budget and enjoy stress free travel. 3. Passport Should be Valid for the Next Six Month. You need to check whether the passport is valid until another six months from the date of travel because some countries do not allow to enter if you don't fulfill these criteria. Many times people are not aware of this and they make travel bookings. Later when they come to know about the passport expiry they have to rush to the passport emergency services. 4. Book Early for Better Travel Deals. Booking early flights will help you save a lot of money. You will find good rates and deal when you book your travel early, say even before one month. Book your hotel early because many hotels give good deals like free city tours or free breakfast. When you traveling in a group or with family early bookings will help you save a lot of money. 5. Make a Checklist for Stress Free Travel. Here you have to make a checklist before you leave your home for a stress free travel. This checklist will contain all the important things you need to keep an eye on, below is the list. g) keep passport size photo or your any official ID card. h) insurance only if you need. Now after the checklist is ready you are set to leave and enjoy your stress free travel. Before leaving see what your flight has allowed the baggage weight and cross-check the weight of your bag. Do not directly keep the bag on the weight scale, If you want to know the proper weight, first check your weight. Suppose your weight is 80kg and then you lift the bag, the bag should not touch the ground or weight scale. Later the weight says 100 kg. So the exact weight of the bag is 20kg. Doing this won't get you stuck at the airport because at that time they will ask you to pay more for baggage allowance. This might be stressful for you as some flights might not even allow excess baggage. Remove the unwanted things from your bags and only take important things with you. 7. Be Ready for Surprises if you Want a Stress Free Travel. You might get stuck in traffic, you might get delayed flights, you might experience some mishaps. Do not panic when this happens and rather find the solution to it. You might see different people, different cultures, different lifestyles. The way they talk and the way they behave. You have to travel with an open mind to make it a stress free travel. All this is a part of the travel experience so you need to be calm and face it. If you do so, you will be a happy traveler and you will enjoy your trip the most. 8. Leave Early for a Stress Free Travel. If you want a stress free travel you should leave early because when you are in a hurry you make many mistakes and tend to forget things at home. Leaving early will give you time and space if there is any problem on your way or at the airport. It keeps your mind stable and calm so you tend not to do any mistakes while you travel. There has been an instance where people tend to sit at home even if they are ready to leave and later they miss their flight because there was a problem while traveling like traffic or line at the airport or baggage drop points etc. It is better to leave early and get done with your boarding and sit at the gate and then do whatever work you want to for a stress free travel. 9. Take Care of your Personal Belongings. You need to take care of your personal belongings and we suggest you keep all the important things with you and not in the luggage bag. It is better to carry important stuff in your handbag like passport, ticket, cash etc. There have been reports where people have lost their important stuff and had huge problems when they were in abroad. Do check everything before boarding and also after landing because sometimes people tend to forget things in flight and then there are fewer chances of getting it back. 10. Always Wear Comfortable Clothes While Traveling. Do not suit up and wear classy clothes when you have to travel. Many people tend to dress well when they travel because there will be a bunch of people seeing them so they have the tendency to look good. It is very uncomfortable when you pass through the security check and you have to remove your boots/jackets or whatever good clothes you wear with that shine jewelry. It is also uncomfortable when you have long flight hours. Keep it simple and carry minimum in your hand luggage for a stress free travel. If you have many different activities to do it is obvious that you need to carry a different set of clothes which suits those activities. Properly fold your clothes and in a well-organized manner, pack it in your bag so that you can fit more into your bag. You can also use packing cubes for a different type of clothing. a) Long sleeve shirts needed for classy outings or maybe a fine dining. e) Socks and a belt. f) A different pair of shoes and slippers. h) jewelry, scarf, and hat. i) swimsuit with wet and dry organizer. 11. The Ultimate Traveling Stress Reliever is a Pillow and Earplugs. This is your survival weapon in the travel packing list because it is very comfortable when you sleep in flight or take a nap at the airport. Sleeping good in flight will help you to be energetic and fresh while you are traveling to your destination. You can also carry earplugs because there will be too much noise and you won't be able to sleep. Make yourself comfortable by carrying these two items and enjoy stress free travel. 12. Relax, Read and Eat to Overcome Travel Stress Symptoms. Be stress free while you are waiting at the flight gate. Get some good book in your handbag or buy the latest from the airport. If you are not a fan of reading books then find some good place to relax at the airport or listen to your favorite music. Do not be hungry because hunger will make you irritated and give you stress. Eat light food and do not overstuff your stomach before the flight. Eating heavy will make you feel uncomfortable in flight. 13. Be Flexible and Safe to Enjoy Stress Free Travel. Many times we have to be flexible and consider the best options for traveling or booking hotels. Listen to people's opinion or your family members opinion and try to analyze what best is suitable for you. This will help you make a proper plan for a stress free travel. Many times what happen is they show and present in a good manner about the hotels online but in reality that is not the case. You can search for your bookings online and try to see the area via google earth or simply google it and read reviews about your hotel. 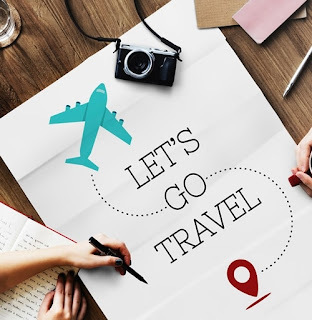 You might sometimes also feel that the bus is way cheaper than the flight but if you are with family then do consider the kilometers of travel and the risk involved in bus travel. 14. Research About the Place you are Going to on Google. Before you visit any country or any place in your country. It is good to google about the place you are traveling to. You need to know about the culture there, how are the people there and what things to do and what not to for a stress free travel. I have personal experience in China where I did not know google do not work there. I had no maps, no google, no Facebook, not even Whats App. Trust me this experience was really bad. So now I have decided if I want a stress free travel I need to know about the place I travel well before in advance. 15. Buy an International Roaming Pack on your Mobile. It is good for your cell phone's sim to be activated if you are traveling internationally. You will need the 4g and also a calling pack for using it locally like searching for nearby restaurants or places to visit. Calling at your home or just been in a little touch with your friends is good. It is good to let someone know about your location and what you are doing and what is the next plan because if any mishaps happen a person will be aware of your locations and he/she might get you some help. 16. Take a Medicine Pack with you for a Stress Free Travel. If you are suffering from problems and you need to take your medicines daily, carry it in a proper medicine box necessary in the travel packing list. Make your travel stress free by simply carrying general medicines for stomach pain, bowel problems, vomiting, fever and cold etc. It will be better if you have a prescription for the medicine you carry. This will help you for a stress free travel if you face any medical problem abroad or on the way to your destination. 17. Include Dedicated Toiletry Bag in a Travel Packing List. Pack a small toiletry bag which can fit inside your luggage because it will take care of your personal hygiene if you do not get proper toiletry of your choice when you travel. The toiletry bag you carry should be waterproof because if any leakage happens it should not affect your main bag things. Following is the list of toiletry items which must be on the travel packing list. a) Toothbrush, toothpaste, floss, mouthwash. b) Comb or brush, bobby pins etc. c) face wash, shampoo, conditioner. e) lip balm or lip gloss. f) personal hygiene items and for females feminine hygiene items. g) Sunglasses and a contact lens with the solution. h) I have a habit to carry a personal mini mirror. i) Shaving kit with extra razors. j) hair gel or oil. k) Scissors and nail clipper. Do not carry all these items with you in your handbag on board. 18. Check your Home Before Leaving. Home care is important before leaving for a stress free travel as many people face problems when they forget to check important things at home. There was an incident where a lady forgot to unplug a kitchen appliance and when the lady was back from the holiday there were no lights at home due to an electrical default created via the continues electrical load of that appliance. Pre-pay your bills before leaving so that when you are back you get all the services uninterrupted. Do not forget to turn off the heater or the air conditioner because if you forget you will get a huge electricity bill when you are back. Keep all your important home stuff in a safe place or in your vault. You should always leave an extra house key and your travel itinerary with a trusted friend. Lock all the doors and window properly. If you have a pet at home who is not coming on vacation with you, please arrange for pet care services. Also, opt-in for lawn care if you have a big lawn so that it is not tiring for you once you come back from the holiday. Write a simple note and stick it to your home door with information such as your return date because if you get any parcel or a visitor they will be aware of this.